This is him playing with my kitchen utensils. He does this quite frequently. 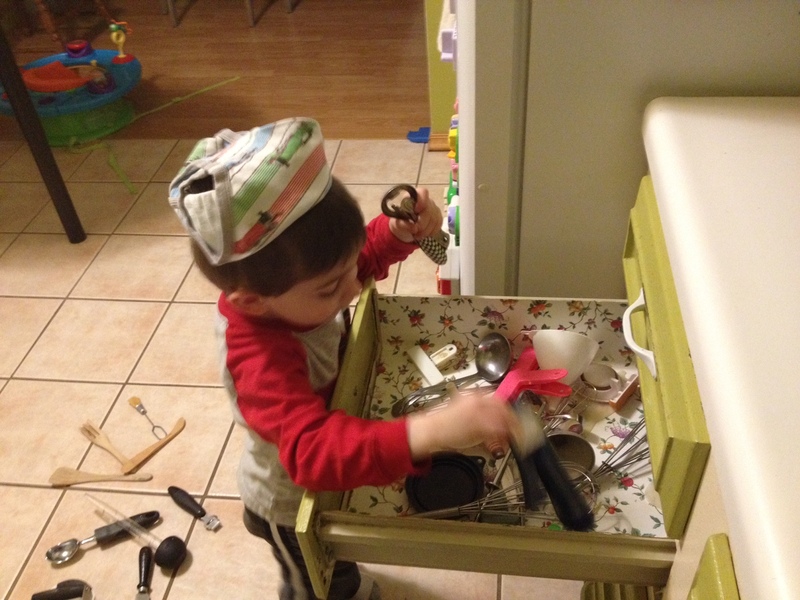 He’ll open the drawer, pull all the utensils out, put them on the floor, and sit and play with them. It’s fun to watch. He gives them all names and creates characters for each one. He even does different voices for them. 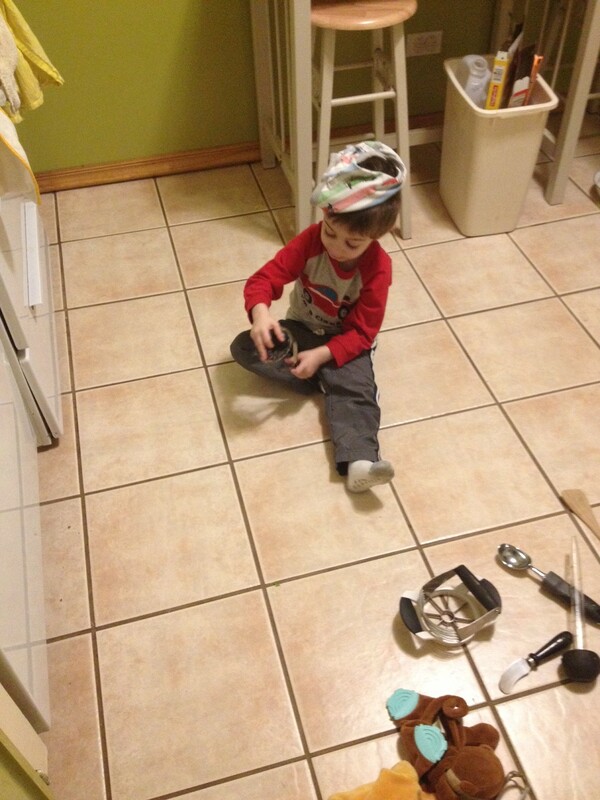 He amuses himself with the kitchen utensils more than his toys. Notice the two toys in this picture are at the far end, away from where he is? He abandoned them to play with the utensils. “G” will do this all the time and it’s not just limited to my kitchen utensils. He’ll play with my belts, my husbands ties, my physical therapy bands, exercise bands, silverware, his fruit and vegetables (I have VeggieTales to thank for that one), markers (he uses them to play with as characters, not to color with), and, as you can see from the pictures, even his underwear. He engages that big imagination of his and creates a whole new world of play for himself. I love it! 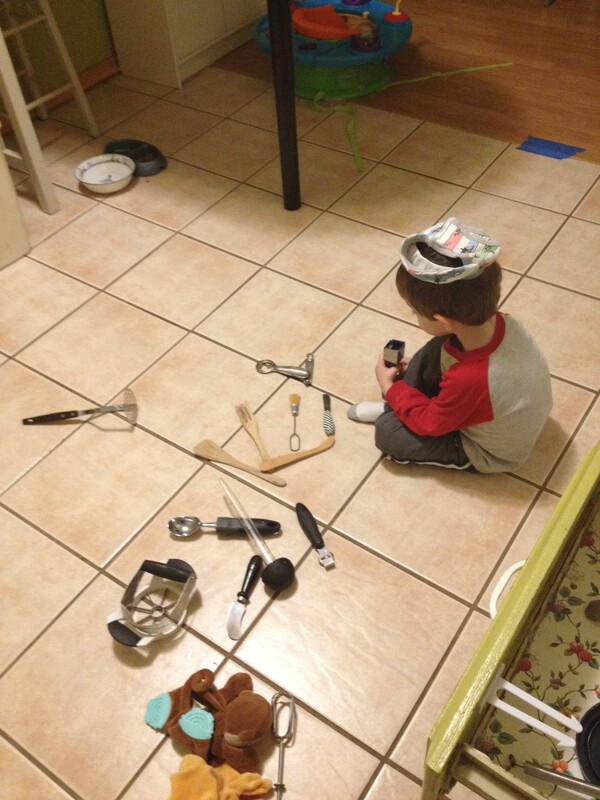 I think it’s fantastic he can use his imagination in this way and doesn’t need toys to do it. That is why I don’t buy him any toys. I like to see how creative he can be with the other objects he finds around the house. Each day brings a new adventure!